Or possibly third thoughts. It’s time for the “let’s look beyond the immediate decision” views on Gonzales v. Carhart, the Supreme Court’s April 18 decision upholding the ban on “partial-birth” abortions. In Legal Times this week, Evan Schultz parses one paragraph in the concurring opinion by Justice Clarence Thomas to find some evidence that Thomas is growing uneasy with, specifically, federal abortion restrictions. Not uneasy enough to vote against them yet. And not at all uneasy with state abortion restrictions. But between the two, there’s room for maneuver. Meanwhile in The New Republic, Benjamin Wittes looks deeper into a paragraph in Justice Anthony Kennedy’s majority opinion [registration required]. Wittes finds evidence that the high court means to discourage all future facial challenges to abortion restrictions—which, he notes, is good news for abortion opponents. But by shifting the legal contest in the direction of as-applied challenges, the Court could render the abortion debate “less binary.” And that, we venture, might just bring the debate more in line with the thinking of most Americans. Last Tuesday, he was pitching for the Yankees. By the end of the week, Colter Bean was back with the Yankees’ Scranton-based farm team. And then over the weekend, Yankees manager Joe Torre decided that yes, he could use the help of the 30-year-old relief pitcher, featured in this week’s After Hours. Bean told MLB.com, the Web site for Major League Baseball, that he hadn’t even had time to unpack his bags. Not that he’s complaining about being back in the big leagues: “If they want me to sell beer, I’ll sell beer,” he said. The American Lawyer has loosed its annual AmLaw 100 ranking of the world's biggest and richest law firms. The past year's most profitable law firm: D.C.'s own Wiley Rein, which scored the highest profits per partner figure in the history of the magazine's survey. With profits per partner of $4.4 million in 2006, the firm bested perenniel money machines Wachtell, Lipton, Rosen & Katz and Cravath, Swaine & Moore. Enriching Wiley Rein: a $245 million contingency fee windfall for representing patent-holder NTP in its half-decade legal battle with Research in Motion, the maker of Blackberry wireless devices. Such fee arrangements also boosted profits at D.C.-based Akin, Gump, Strauss, Hauer & Feld and Finnegan, Henderson, Farabow, Garrett & Dunner. For the first time, more than half of America's hundred highest grossing law firms hit $1 million in profits per partner. Eleven U.S. firms generated more than a billion dollars in revenue, though the rankings of the five largest firms in the U.S. was unchanged over 2005: Skadden, Latham & Watkins, Baker & McKenzie, Jones Day, and Sidley Austin. Additional data from this year's survey can be accessed here (free registration required). Big day at the Supreme Court: Two reversals for the U.S. Court of Appeals for the Federal Circuit (well, that's nothing new) in major patent cases, Microsoft v. AT&T, and KSR International v. Teleflex. Also, a true first for the justices: a decision that includes a videotape exhibit that the Court has placed on the Internet for public viewing. That came in Scott v. Harris, in which the 8-1 majority found that a Georgia law enforcement officer's high-speech chase of a suspect, ending in the officer bumping his target off the road, was reasonable. The pursuit is on tape, and Justice Antonin Scalia, writing for the majority, said the videotape "more closely resembles a Hollywood-style car chase of the most frightening sort." The counsel table inside a courtroom is a revered resting spot, reserved for those granted permission by the presiding judge. But Montgomery Blair Sibley so wanted a chance in the spotlight that he took a seat at the table next to his client, Deborah Jeane Palfrey, on his own. Palfrey, of course, is charged with running a high-end prostitution business in Washington, D.C. Though Sibley represents her in her civil forfeiture cases, he is not her criminal counsel — and has already been chided (subscription required) for unduly stepping into the criminal case. So when Sibley approached the podium to ask Judge Gladys Kessler for permission to remain at Palfrey's side, Kessler balked. "I'm sorry, Mr. Sibley," Kessler interrupted him. "Excuse me," Kessler continued. "Let me be clear. You are not the attorney in this case." "You do not represent her in this criminal case," she said. "I will continue to explain all her rights to her," she added. "We'll take care of this one," Kessler concluded and Sibley slipped into the first row of public seating. Of course, Sibley, who periodically shook his head as he furiously took notes during the proceeding, had quite an audience of reporters — the largest gathering in Palfrey’s case since she was indicted last month. During the hearing, Kessler granted Palfrey’s request for a new lawyer (subscription required), noting the “irreconcilable differences” between Palfrey and her court-appointed counsel, A.J. Kramer, head of the D.C. Federal Public Defender. But Kessler refused Palfrey’s request to name Herald Fahringer who once represented Hustler publisher Larry Flynt, as her new attorney. Simply put, Kessler said, the law “does not give you the right to select counsel.” Nor would Kessler set aside any specified funding for Palfrey’s defense. (This time around Palfrey had asked for $150,000.) But the judge said she would appoint a new lawyer by the end of the week. Palfrey had one last problem: her approximately 5,000 shares of Dolby Laboratory stock, which had been seized by the government. With a recent surge in share price from $22 to $37, Palfrey wanted permission to sell the stock now. But without further background, Kessler wasn’t willing to make a call today. Following the hearing, Palfrey and Sibley headed to the front steps of the courthouse where a crowd of cameras (almost as many as on the day Scooter Libby was convicted) awaited her. She read from a lengthy statement about her recent disclosures of client names. “I believe there is something very rotten at the core of my circumstances, and without money to hire my own investigators, I must reply upon your acumen and talent to uncover the truth,” she said. But, the throng of reporters wanted to know, didn’t all this naming names and finger pointing amount to blackmail? Today is Tax Freedom Day, according to the Tax Foundation, a research group in Washington, D.C. The group calculates that up until today, Americans have been working for the government--i.e., all our earnings will go to pay taxes. Staring tomorrow, our money is our own. The date is figured by dividing total tax collections by total income, converting that into a percentage (in 2007, 32.7 percent), and then converting that percentage into a number of days worked. April 30 is a national figure. Different states have different tax freedom days because of their different tax rates. For 2007, Virginia's is April 30, Maryland's is May 1, and the District's is May 12. Tax Freedom Day has varied over time. In 1900, it came on Jan. 22. In 1950, April 1. The latest date was May 5, in 2000. Foley & Lardner is looking to expand in China. The firm announced today that it has filed an application with the Ministry of Justice of the People’s Republic of China to open shop there. It appears Foley likes its odds in getting approval for the office since it has already hired Catherine Sun, who was a partner in Weil, Gotshal & Mange’s Shanghai office, where she led the firm’s intellectual property practice in China. She is licensed to practice in New York and will be assigned to the firm’s New York office during the license application process, but will be stationed in Shanghai. Sun will chair the Foley’s Asia practice. The Jack Abramoff scandal may have flared up with the guilty plea of Mark Zachares, but that doesn’t mean Jack’s old firm, Greenberg Traurig, is feeling the heat. Greenberg, which has struggled to rebuild its Washington lobbying presence since the scandal, recently signed on six new clients. The firm appears to be building a specialty in defense and defense real estate with lobbyists Joseph Corrigan and Christopher Romig registering FPL Energy, Homeland Security Corp., JTL Capital, Leewood Real Estate Group, and Saab Microwave Systems. Greenberg’s Robert Harding also signed on to lobby HUD for Stellar Management to get approval for the Mitchell Lama Development. Purges? The latest from Iraq: how the Iraqi Prime Minister’s office is throwing out police and army officers for being too successful in challenging the Mahdi Army. Never mind some movement afoot on the diplomatic front: that Condi Rice is expected to meet with high-level Iranian officials this week. Political Flavor: Al Gore got rid of him, but Mark Penn is back as one of Hillary Clinton’s chief strategists, according to this piece. Or take a look at Barack Obama’s search for religion, from his Muslim roots to a Chicago church. Bloch’s Block: He’s thrown himself into one of today’s most controversial political probes—whether Karl Rove and other White House officials used federal resources for Republican campaigning. But Special Counsel Scott Bloch has been at the center of a good deal of controversy and investigation himself. The Czar: It’s probably not the job most lawyers imagine finding themselves in, but Stephen Hadley, Bush’s law school trained national security advisor, is on the hunt for a war czar to oversee Iraq and Afghanistan. The Balancing Act: He’s been called the new Sandra Day O'Connor. Slate takes a look at Justice Anthony Kennedy and the jurisprudence of his swing vote. 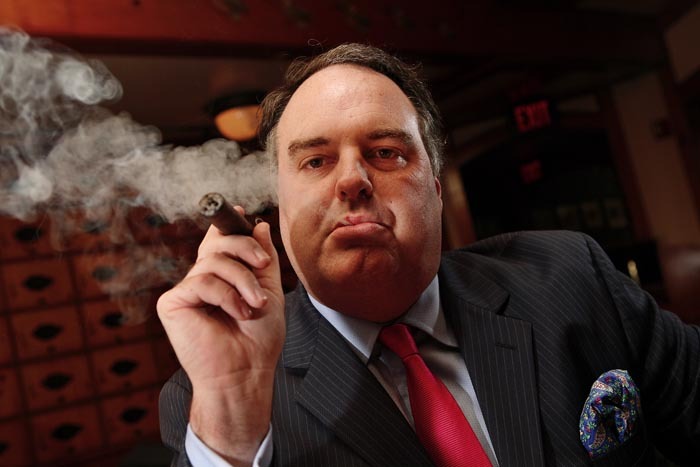 Ron Philips, a Republican lobbyist at mCapitol Management and notable cigar smoker, is heading to Bolivia on Sunday to seal a two-year lobbying contract with the Bolivia Community Development Foundation. The group, composed of private businessmen supportive of President Evo Morales, is akin to the U.S. Business Roundtable. While Phillips will not be paid by the government, he will be lobbying to improve relations between the U.S and Bolivia, strained since Morales nationalized natural gas in his country and backed cocoa farmers as the U.S. continues its effort to eradicate the cocoa leaves.